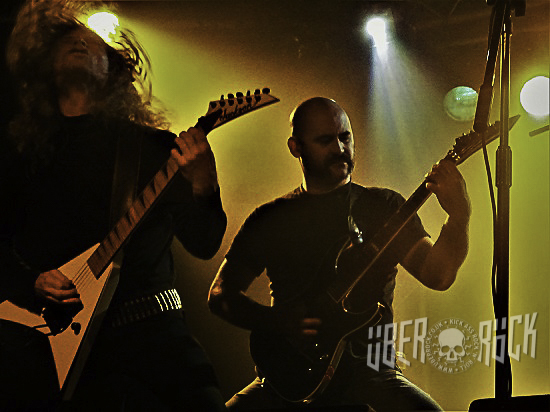 Stalwarts of the extreme metal spectrum, both Anaal Nathrakh and Akercocke boast over two decades’ experience at the forefront of the most punishing music on the planet, their careers standing testament to the power of constant reinvention and development as they push their respective genre into bold new territories. 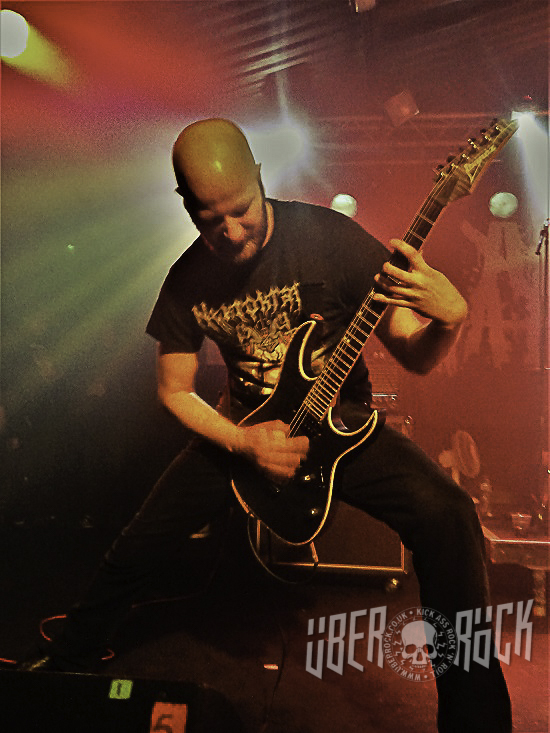 To see the pair on a headline run then, provides an opportunity to engage with two of extreme metal’s most luminary names, recognising the incredible contributions that both have had to heavy music, and in Anaal Nathrakh’s case as a hometown show no less. The first lesson in punishing, unrelenting noise for the evening comes from local industrial hatefuls khost. The pair conjuring a solid wall of hateful noise that could contend with the likes of Swans. Blaring a horn like judgement come for the crowd, khost are an endurance test, their employ of solid, drone-like riffs setting the teeth on edge and the face melting away under sheer harshness. Utilising intro tapes, elongated notes and guttural vocals, the band present an impenetrable sense of non-commercialism, every aspect of their sound designed to test just how far they can push the listener before breaking point. Against the speedier, more furious assault of Nathrakh or the angular oddity of Akercocke, the band present a very different take on extremity, but one that proves no less effective as they plow through a solid support set which sets the tone for the evening. The pace picks up considerably as Akercocke take to the stage, the band letting loose with the demonically inclined ‘Horns of Baphomet’ to direct things in a much more recognisable death metal avenue. 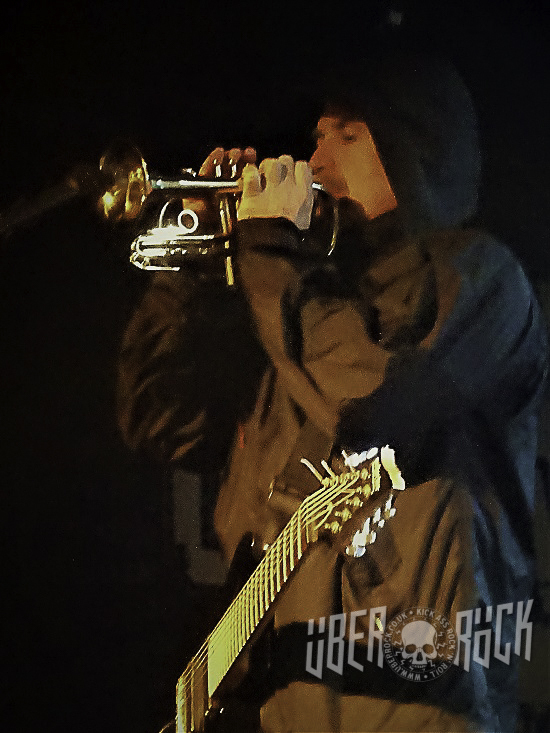 The ensuant set pulls from across Akercocke’s not inconsiderable discography, each new song fitting in seamlessly whilst still professing the level of evolution the band has employed from day one. ‘Verdelet’ straight away showcases the band’s utilisation of gothic, clean-vocals that has become more apparent as time has worn on, adding a Paradise Lost like flavour to their extremity that leaves the band somewhere between classic-era Opeth and Emperor in execution. Jason Mendonça is one of extreme metal’s most versatile vocalists, and this set uses that to its full extent – whether in growls, BM-shrieks or clean vocals, every single song is delivered exceptionally, no single element sounding stronger than the other. In turn, this shows just how authoritative Akercocke are within the realms of extreme metal, able to seamlessly transition between prog-ish elements, death, doom and even black metal without losing any momentum, making it all sound distinct as part of the same blackened cauldron. Holding sermon throughout the set, Akercocke are (rightly) held in some reverence, the band exuding a sense of intense control over every aspect of their performance, everything delivered with a precision that leaves so many of their contemporaries (and successors) feeling amateur and sloppy by comparison. If Akercocke were pin-point accuracy, Anaal Nathrakh are a carpet bomb on the senses, absolute bedlam right from the off. Opening their set in the same way as last year’s ‘A New Kind of Horror’ (‘A Road To…’ intro straight into ‘Obscene as Cancer’), the band blow the doors right off as they clatter around the stage, bringing a kind of punk energy to extreme metal most comparable to fellow locals Napalm Death (Shane Embury of whom can be seen grinning at the stage as the band first come on). Existing between grindcore, death metal, industrial and even prog, Nathrakh are impossible to pin down to any one area of extreme metal, promising a masterclass in whatever subgenre they decide to dive into. And yet, for however heavy they get (and believe us, they get heavy), there is always a sense of cohesion, an ear for massive choruses meaning its not surprising to see large swathes of the crowd shrieking along throughout the set. If ‘Obscene As Cancer’ offers up a diverse mix between hyperactive grindcore and a Devin Townsend-esque chorus, ‘Monstrum in Animo’ is a furious take on hybridised black metal, the shrieks and ear-shattering blastbeats ensuring that the style has never sounded more vitriolic. Throughout the set no member seems content to stop snarling, gesturing or bouncing around the stage, the carnage on-stage barely matched by the onslaught of flying bodies that soon start clearing the barrier into the pit. With ten albums to choose from, Anaal Nathrakh aren’t at any risk of running out of material from the set, so to see them flying between records with equal vigour is a huge statement to how this band perceive their discography; there are no duff records here, and absolutely everything is part of the greater whole. Between songs Dave Hill takes full advantage of the fact this is a hometown show to provide plenty of between-songs patter, admitting that the band seldom play home-town shows these days, and even less frequently play venues like The Asylum, opting instead for more intimate settings like The Hare and Hounds. 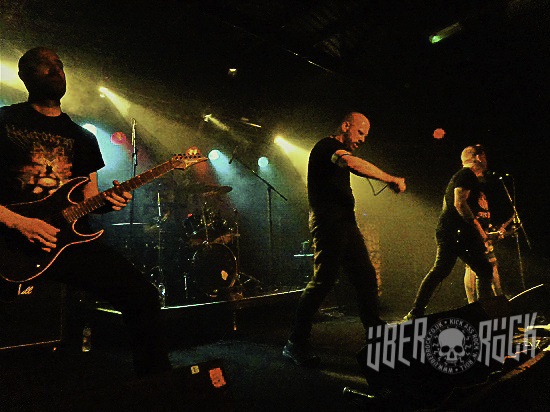 The larger room lends Nathrakh a sense of enormity tonight, and every single sound sounds utterly monolithic, crushing the audience under the sheer weight of their music. Songs like ‘Forward!’ feel as close to anthems as extreme metal gets, the song’s liberal use of gunshot samples against the drums lending it a potency that is sure to put a smile on any heavy-minded listener. All three of the band’s for tonight’s bill represent a very different approach and take on extreme metal, and yet between the three a sense of unity that cannot be shaken, that in reaching into the depths of heaviness each act is able to bring about a unique sense of identity that goes far beyond the usual nous of heavy metal fandom. Reaching deep into the archives for their encore, the band come back onstage for ‘Do Not Speak’, complete with the declaration “for a picture of the future, imagine a boot stamping on a human face forever” that signals its time to get right back into the fray. By the time the band close proceedings on a blistering rendition of ‘The Joystream’ there is no doubt in anybody’s mind; they truly are Birmingham’s finest, inhabiting a space of legacy only closely matched by the likes of Cathedral, Bolt Thrower and (perhaps most notably) Napalm Death. 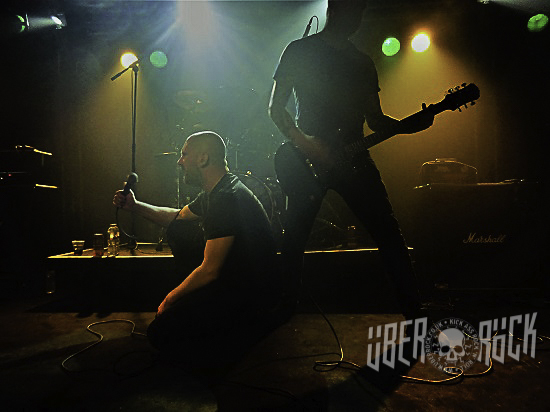 Now 20 years into their career, Anaal Nathrakh are showing no signs of creative fatigue, nor concern with carving a comfortable niche for themselves; this is a band still very much at the forefront of extreme music, every step along the road paved by releases which could be used as a blueprint for an exciting, volatile future. PHOTO CREDIT: Photos © Rich Hobson/Über Rock. You can view our full gallery of photographs HERE.